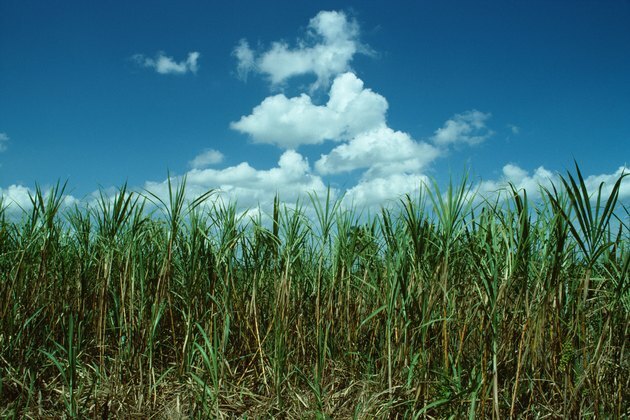 Sugar cane is actually a perennial grass that grows in tropical regions. This humidity- and heat-loving plant produces tall, edible canes and enjoys a soil pH of 5.5 to 6.5. 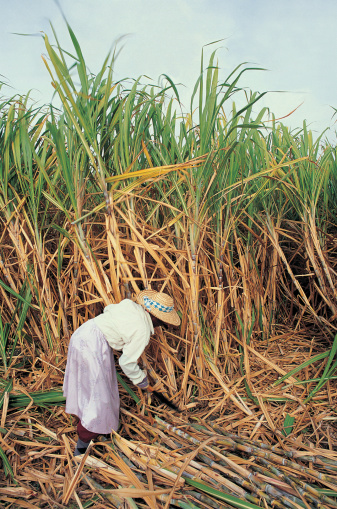 If you live outside of a tropical climate, you'll be most successful growing sugar cane in pots. If you give sugar cane enough water and bright, direct sunlight, you'll enjoy your own sweet sugar canes grown in your own home. If you cannot provide your potted sugar canes enough direct sunlight, try supplementing with 40-watt grow lights. Purchase a healthy, young 6-foot sugar cane stalk from a local grower, nursery or online plant seller. The sugar cane stalk should have at least 10 to 12 node buds, spaced about every 6 inches along the cane. Cut the cane into two equal sections that are 3 feet each using a hand saw. You'll want each of these "seed pieces" to contain at least six buds. This will improve your chances of healthy bud germination. Place the cut seed pieces horizontally on a seed tray filled with a mixture of one part potting compost and one part grit. Spread a 2-inch layer of compost on top of the seed pieces. Moisten the tray contents thoroughly. Cover the seed tray with a clear plastic lid or plastic bag and place the tray in bright sunlight. Provide bottom heat to warm the soil set for at least 68 degrees Fahrenheit. Spray the tray contents with a water to keep it moist. Remove the plastic bag or lid when the sprouts, or "ratoons," begin to sprout. This usually takes about three weeks. Separate and plant the ratoons into individual 6-inch planter pots with drainage holes when the shoots are about 3 inches tall. You can use an all-purpose potting mix or a potting compost and topsoil mixture in your pots. Water your sugar canes two or three times per week to keep the potting soil moist at all times. Place the planter pots in bright sunlight. Maintain a temperature between 70 and 95 degrees Fahrenheit, and no colder than 65 degrees.